On February 21, 2009, the city and fortress Sebastopol, the mainstay of Russia's Black Sea might for two centuries, celebrated the 225th anniversary of its founding. The history of Sebastopol is closely tied with that of the Black Sea Fleet, which began a year previously - on May 2, 1783, when the Azov flotilla were moved from Kerch to the Akhtiarskaya Bay. A very convenient cove became the main base of the fleet, and a settlement that sprang up on its shores, a fortress and a city. The fleet, and Sebastopol, gained in strength and expanded - as did Russia's influence on the Black Sea. It took Russia several wars to win back the Black Sea coast from the Ottoman Empire and liberate western Black Sea countries and the Balkan states from the Turks. Basing in Sebastopol, the fleet took an active part in Russian-Turkish wars by blockading the coast, providing artillery support for troops on the shore, and, finally, engaging the enemy's fleet. A revolution and a civil war that followed, when power in the Crimea changed hands several times and the Black Sea Fleet practically ceased to exist, were a rude shock to the fleet and city, far surpassing an allied blockade during the Crimean War, which ended badly for Russia. In 1921, for the first time after the revolution and collapse of the Russian Empire, the city got a new status: it was made part of the Crimean autonomy, which in turn became part of Soviet Russia. Soon the military base and fleet began to be restored. On June 22, 1941, the Black Sea Fleet repulsed air raids by German aircraft on its bases, heralding its entry into World War II. Despite the fierce resistance put up by Soviet troops, developments on the front did not benefit Russia, and German troops broke into the Crimea. On October 30, 1941, Sebastopol lived through a second defense in its history. The enemy used the most powerful cannon available at that time in besieging it. The Germans captured the city on July 9, 1942. The Black Sea Fleet retired to Caucasian ports, with Poti becoming its main base. Sebastopol was liberated from German troops on May 9, 1944, exactly a year before the war's end. After the war, the destroyed city was rebuilt anew. In 1945, it joined the Crimean Region as a regionally administered city. In 1948, Sebastopol got the status of a republic administered city within the R.S.F.S.R. (or in modern terminology, a city of federal significance, like Moscow and St. Petersburg). Sebastopol was never stripped of that status, and the handover of the Crimean Region from the R.S.F.S.R. to Ukraine did not alter its standing as an independent administrative unit reporting directly to Moscow. After gaining the status of Hero-City, it still remained the main base of the Black Sea Fleet, whose operating area now reached far beyond the Black Sea - with its ships plying the waters of the Mediterranean and Red seas, and the Atlantic and Indian oceans. This state of things lasted until 1991. Following the break-up of the U.S.S.R., the city, without any agreement or a public vote, was included into Ukraine, despite its republican status, which was introduced in 1948 and was never repealed. Russian President Boris Yeltsin took no steps to challenge that inclusion, and in 1997 signed a treaty sealing that state of affairs. 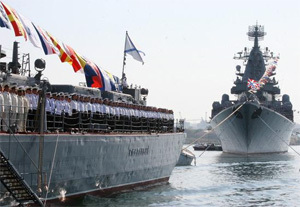 The city remains the main base of Russia's Black Sea Fleet. The fleet, though heavily trimmed, is still capable of upholding Russia's interests - as the five-day war of 2008 and long-distance missions by its ships have shown. In 2017, according to current documents, the Black Sea Fleet must abandon its base, and the St. Andrew flag over Sebastopol will be finally lowered. No one knows how events will shape in our rapidly changing world after that, but it is to be hoped that the Russian history of the fortress and Hero City of Sebastopol will not be limited to the years 1784 and 2017.